This week the book Water and Witchcraft – Three Years in Malawi has been professionally re-edited, re-formatted and re-launched. If you purchased a copy in the past and would like the revised edition, please inform me and I’ll email the updated ebook. During the coming weeks the same updates will take place with two of the sequel books in the African Raindrop Series – The Deep Sand of Damarland – A Journal of Namibia, and Water After War – Seasons in Angola. 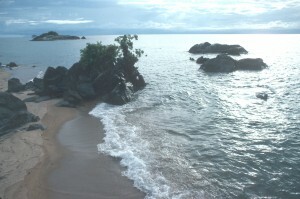 In celebration of this first book update – here is an article about a journey I took along Lake Malawi long ago. In 1858, David Livingstone pointed his steamship Pearl up the Zambezi River and headed into trouble. His plan, to follow the river upstream into the interior of East Africa, was twisted by an unforeseen problem: the Pearl was too large to navigate the river mouth waters. Undaunted, he abandoned this ship, then puffed upriver in a wood burning launch named the Ma Roberts. This tactic proved futile. Steamy rapids and the dangerous gorge at what is now Caborra Bassa in Mozambique blocked his way. Refusing to give up the expedition, Livingstone sidetracked up a little known tributary of the Zambezi named the Shire (SHEE-ray). Wary Portuguese sailors had warned him of its dangers: the waters were reputedly clogged with duckweed, and visitors were targeted by poison arrows from riverbank tribes. Ignoring the advice to steer clear, Livingstone persevered and became the first European to view what is now named Lake Malawi – the third largest lake in Africa. Today, the lake can still be dangerous. Canoes are overturned by hippopotamuses, and crocodiles scan the shores for prey. Earlier this year the Nyasa Times reported a hand-dug canoe capsizing, drowning one fisherman and causing two to disappear. The recently published book This is Paradise is titled after words written in a letter by a 25-year old Irish volunteer to his mother. He was describing the coastal village where he lived along southern Lake Malawi. In the letter, he urged her to visit. Two days after writing the letter he drowned in the lake. 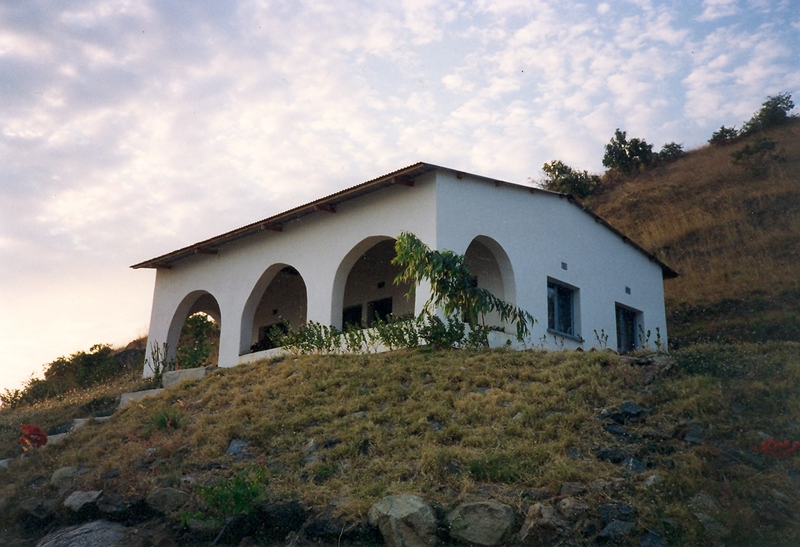 His mother eventually visited the site and established a modest health clinic, described in the book. 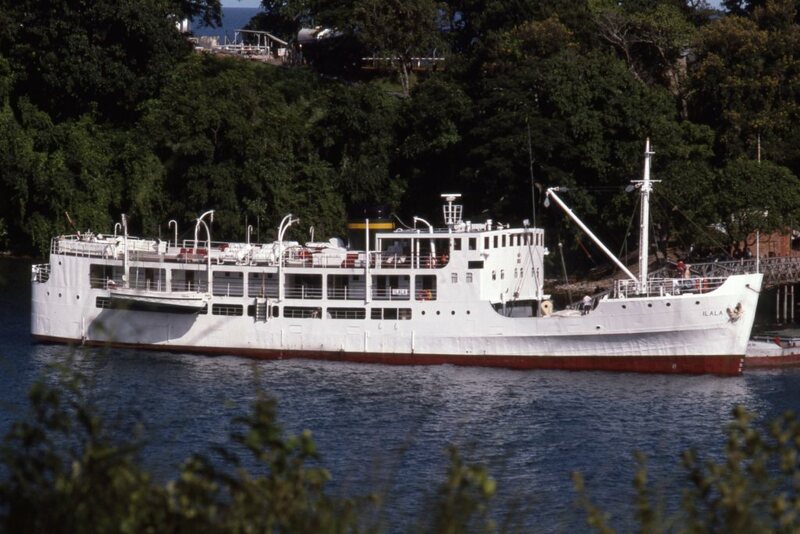 A few decades ago I boarded a newer version of the steamship Ilala as it was about to chug up and down the western periphery of Lake Malawi. The journey was both scenic and informative: the steamer plowed up the Great Rift Valley, and provided ripe vistas of coastal Malawian villages. I boarded the Ilala at Nkhata Bay, a lively cove tucked between hills mid-way along the western lake shore. The little steamer snorted smoke as it rounded a final hill toward the port, appearing squeezed out of the colonial past. Once I was aboard, a steward named Patrick showed me my cabin. It looked somewhat like a furnished boiler room – though freshly painted, clean, and comfortable. Despite the ship’s age (launched in 1951) the Ilala looked a handsome craft. It was one hundred and seventy-two feet long and could hold 460 passengers – a small fraction of them in the seven first class cabins. For those who traveled first class, the complete upper deck was ours to stroll along, or to relax on in deep, bright deck chairs. But while it was still docked at Nkhata Bay, this deck was fair game for everyone to visit. Locals crowded onto its open bar and drank and danced until a loud speaker shooed away the wobbling last stragglers at three a.m. This was the second Ilala. The original ship was launched in 1875, named after the village where Livingstone died in what is now Zambia. It was built in Scotland and sent to East Africa, then piloted up the Shire River to the Murchison Cataracts. Once there it was taken to pieces that were painstakingly carried over land – on the heads of sweating villagers – up to the lake, where they were reassembled. 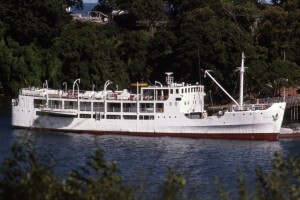 The Ilala was the first steamer to circumnavigate Lake Malawi. Its presence was intended to help spread the missionaries’ faith and send a clear warning to slave trading dhows: that their commerce was no longer welcome. The Ilala finally puttered north at four a.m. By six, sunlight shattered the morning as rays poured off the distant peaks of Tanzania. A set of knuckles rapped on my door, and Patrick entered to serve tea. The ship anchor had dropped near Usisya – a triangular patch of land scrunched against steep lake shore peaks. Villagers gathered at the beach in an early morning frenzy. Chains clanked as two of the Ilala’s launch boats splashed into water. 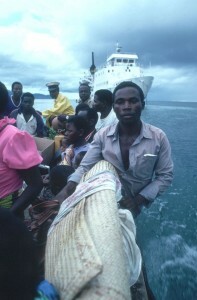 These ferried passengers with their crates, sacks and bulging suitcases to the shore. Their luggage was a jumble – bed frames, beer crates, a wheelbarrow, and chickens squawking in a basket. I reclined in a deck chair looking at the mountainous shore as the Ilala pulled away. Before steamboats penetrated up Lake Malawi, Arab dhows had crisscrossed east and west along its waters, packed tight with their lucrative cargo of slaves. Malawi then provided rich pickings for Arab slave traders who tethered their captives in chains, marched them to the shore and then shipped the bodies to the eastern lakeshore in dhows. From there, prisoners were whipped and corralled on foot to ports along the Indian Ocean, where they were sold or traded, then exported. Conditions of this journey were brutal; the majority died before reaching the coast. Livingstone tried to squash this slave trade by creating alternate lake-based commerce to compete. Only after he died did his efforts take off with the help of the original Ilala. The steamer ferried troops to chase slave merchants away, thereby opening the lake waters to alternative trade. I finished drinking coffee on the deck and walked downstairs. The entrance aisles were crowded with open crates. I plucked a plastic bag from one. It was clear and filled with water. Inside, striped fish darted back and forth. Their colors, bright and showy, sparkled like jewels. For collectors of tropical freshwater fish, Lake Malawi is a cornucopia, boasting a greater variety of species than any other lake in the world. The predominant ‘cichlids’ are as important to the study of evolution as Darwin’s finches, occupying virtually every possible ecological niche in the lake. High above this ship, along a steep escarpment, sat the Livingstonia mission, far removed from its original placement along the lake’s southern end. The scourge of malaria had prompted its transfer to this more northern site. Livingstone himself, sadly, never even ventured far enough north to see the site where the mission eventually settled. At midday I sat for lunch in the small dining room where avocado salad, grilled chambo fish, potatoes, and chunks of fried mango slices were served. For dessert I ate a plate of paw-paw crumble and drank Malawian coffee. As I finished eating, a barefoot young boy tip- toed in and timidly handed out a miniature dugout canoe for sale. I paid for it and stashed the souvenir in a pocket. By the time we pulled into Chilumba port in the early afternoon, the distant peaks of Tanzania grew sharper. A thunderstorm cracked open and lightning split the distant sky. I was sweating. The heat came not from sunshine, or exhaust fumes from grunting engines, but from malaria. Worn rubber rings tethered to the boat’s side groaned as the Ilala knocked against the port. It was as though the past rubbed against the present. Leaving along the gangplank, I ducked under bundles that wobbled on top of women’s heads, then stepped onto the new concrete dock. I watched a crane hoist bulging maize sacks from a barge while nearby men loaded wood crates onto a truck. Legitimate commerce was now firmly rooted where slavery once flourished. Livingstone’s goals of replacing lakeshore slave trade with alternative business had eventually been realized. If Livingstone could stand on the Ilala today and watch the dockside bustle, he would be pleased at the sight of the progress. His persistence to establish commerce had paid off. When my motorcycle was finally unloaded from the ship, I revved the engine and drove to Mzuzu – to home – to rest and recover.